I know it is not strawberry season, however I just couldn’t resist! Truly an incredible combination of flavors, sweet and spicy. Here in California strawberry season will be just around the corner. Place the strawberries in a heavy, medium-size pot. Remove the stems and seeds from the chile (no soaking is required) and discard. 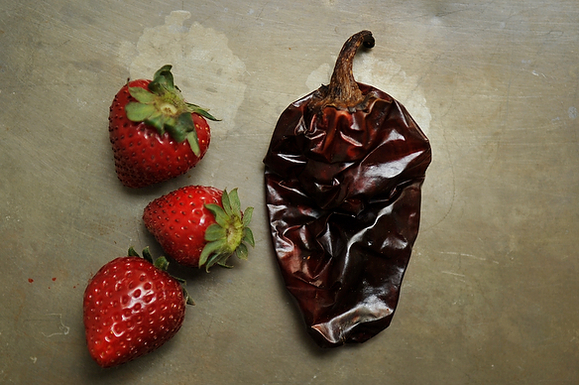 Roughly chop the remaining dried chile flesh, and add it to the strawberries. Pour in the sugar.Set the pot over medium heat and bring to a boil — as the fruit begins to juice, the sugar will melt. Reduce the heat to a steady simmer and cook for about 1 hour. You’ll want to give it a stir every 10 minutes or so — do so gently because you want the strawberries to stay intact and essentially candy. Taste it every now and then to make sure there’s enough chile heat and flavor for you — if not, add another!As the preserves cook, use a spoon to lift off any scum that rises to the surface. The preserve is ready when the strawberries are shrunken and lightly candied, and the syrup has thickened but is no t so thick that it’s like jelly. (The best way to test it is to pour a little bit onto a plate and let it cool before checking the consistency.) Stir in the lemon juice and remove the pot from the heat.Serve on toast or scones with butter, over ice cream and on cakes or biscuits. Refrigerate any leftover preserves.